The IFI Irish Film Archive has contributed extensive material to the new RTÉ One documentaryThe Irish Revolution, providing rare glimpses of Ireland in the years before and during the War of Independence. The new series, which began on Monday February 4th and continues tonight and next Monday, is based on the exhaustively researched The Atlas of the Irish Revolution, published in 2017 by Cork University Press and edited by John Crowley, Donal Ó Drisceoil, Mike Murphy and John Borgonovo. Produced as part of the celebrations of the Centenary of the Irish War of Independence, the series focuses on the formation of the first Dáil in 1919 and the subsequent struggle leading to the Irish Civil War. The IFI Irish Film Archive worked with the team at Tyrone Productions to source illustrative footage from this tumultuous time in Irish history, giving audiences a rare chance to step back more than 100 years to see familiar places in a whole new light. You can watch behind-the-scenes of the archival process here. A significant amount of footage was used from Come Back to Erin, a 1914 melodrama produced by theO’Kalem Film Company. Sadly, only one reel of this three-reel film survives and was discovered at the Museum of Modern Art in 2011. It includes the dramatic, trans-Atlantic emigrant tale of Peggy O’Malley (Gene Gauntier) who leaves rural Ireland in search of a better life in America. This is combined with striking documentary-like elements such as an emigrant ship leaving Cobh and the Killarney cattle market. 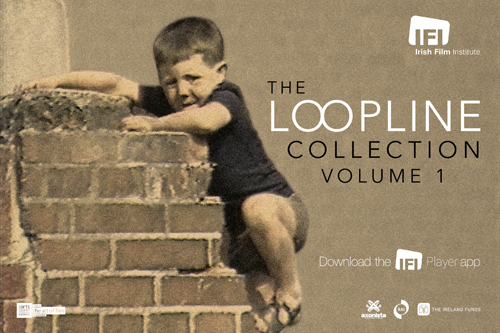 You can watch the surviving footage here for free on the IFI Player. Episode two, which airs this evening Monday February 11th from 21.35, will also include footage from the The Dáil Bonds Film. This sequence, shot in 1919 on 35mm film, shows Michael Collins reading a letter from Michael Fogarty, Bishop of Killaloe, pledging financial support to the new self-declared Irish Republic. The Dáil Bonds Film played an instrumental role in the success of the Republican Loans campaign. It captures thirty Republicans and survivors of executed 1916 leaders queuing to obtain bonds and includes Arthur Griffith, Erskine Childers, William Cosgrave and the widows of Eamonn Ceannt and Joseph Plunkett, among others. You can watch the original material here. 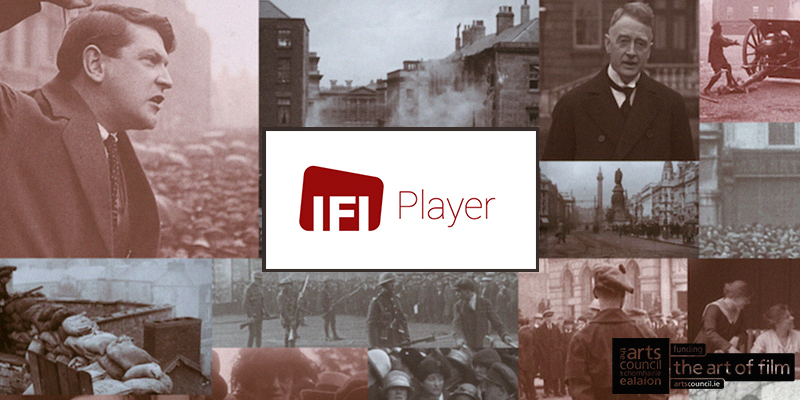 This is just a small glimpse of the wealth of material available on the IFI Player, with an entire collection dedicated to repatriated newsreels from the early years of the 20th century. While accessing the Irish Independence Film Collection on desktop or mobile you can use an interactive timeline to choose which period you want to view, from 1900 to the aftermath of the struggle in 1930. Click here to view this collection on desktop or here to download the app on Android or iOS. Much of the work of the IFI Irish Film Archive is a battle against time to save materials that are in danger of deterioration. While we are grateful to be funded for many of our existing projects, there are many more that require the resources of our team to ensure their preservation for generations to come. Your support means that we can ensure that more of our moving heritage is saved, restored, presented and shared, and we really appreciate any support you may be able to offer through our donations page here.